The Golf Mentor is ultimate learning system. It is fun to use and you can link to your teaching professional. Sign up to try the Golf Mentor FREE for 10 days! No credit card needed. For a limited time, there is a free 10 day trial of premium membership. You can improve more quickly with less effort. You can set goals, so ensuring you will be guided by a clear aim. You can have a free online handicap that goes up to 99 over par, so it is useful even if you are a beginner. You can post practice sessions and games in order to capture key aspects of what you are learning. You can use the advanced mental game training, so improving your performance when playing. You can take a set of scientifically designed challenges, that cover the full swing, approach shots, near the green, and putting. You can analyze your game to identify strengths and weaknesses. It can make a huge difference to your game and it is fun to use. 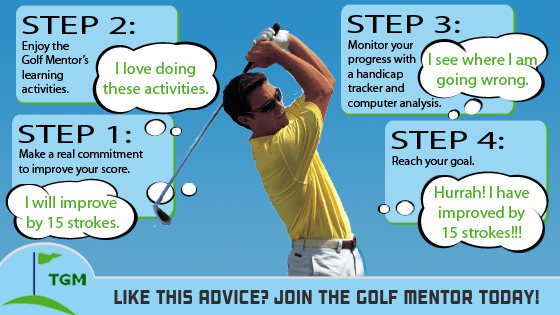 Ready to Improve with The Golf Mentor?